The villa has 2 double bedrooms/living & Kitchen with private 55sqm Swimming pool surrounded by Ample tiled veranda with Sun beds and out door furniture for pool party and sun bath. All rooms are Air-conditioned. Breathtaking views from balcony and private ground/garden. Walking distance to local Tavernas, Inka Supermarket and village square. Well situated to visit a great variety of villages of ancient history/archaeological or typical local life interest. Situated in one of the highest sea level of the village which provides an entire clear view of the village, sea and mountains. Away from the main roads and village which gives a peaceful environment with soothing sounds of nature. The beautiful sandy beach of Kalives only 15 min drive. The beaches of Almyrida and Georgioupolis are 20-30 Min drive. The Villa has land line phone. You can call any Greek land line phone free of charge. Please contact owner for this service. Hot air condition and electric heater in every room. We provide unlimited down load wired or WiFi internet with land line phone. There will be a additional charge of €30 will apply for 07 nights. Contact owner for this service. Ceramic hob, oven, fridge/freezer, dishwasher, microwave, kettle, toaster and all dinning/ cooking utensils (cutlery, crockery, glassware etc). Large balcony with Sun beds You can have all privacy in this Balcony. The villa have all inflatable pool toys for children. The swimming pool is Private and only belongs to the villa. All out side furnitures and sun beds are available. Unfortunately our stay was terrible! Don´t go there during the fall anyways, since the place is crowded with worms, both outside and inside the villa. The bottom of the pool was invaded with worms as well and no one was there to clean it up during our whole stay. The place inside wasn´t either that good cleaned and I had to throw out about 20 worms when we arrived, they were everywhere. If you touched them they excreted some horrible smell. The pool isn't at all that big as it is said in the description but it doesn´t matter since no one felt like swimming in it because of the crowd of worms. The only thing good about the place was the view. Unfortunately we didn´t want to sit outside on the terrace since the worms crawled all the way up here too. We booked a hotel our remaining stay which made this a very expensive holiday. And no feedback from the owner even though we emailed lots of times. We are saddened to hear this visitor found their stay an unsatisfactory experience. Our guests having a happy stay is our number one priority. Unfortunately, we were not contacted with the problems described until after the duration of the stay. Furthermore, we were not aware that this guest left the villa before their departure date. We have a team of staff on hand that can be contacted to visit and help with any problems or issues that arise. The pool is cleaned by a professional company that can be called to visit at any time. Had we been made aware of this situation during their stay we would have investigated immediately and made every effort to resolve these issues. We have been renting this villa since 2011 and have not experienced a complaint of this nature with another guest. The villa is located in a very natural setting and is subject to the seasonal flora and fauna appearances. In the guest book situated in the villa we have a list of some that you may come across and information regarding them. During the months of October to February harmless black millipedes are famous for appearing all around the rural countryside of Crete. Upon receiving this visitor’s feedback we investigated the villa and did not find the situation described. We would advise that if you come across any problems upon your arrival or at any point during your stay to let us know as soon as possible so that we can respond and be of immediate help. A beautifully located villa in a ideal location! We really enjoyed our time in Crete staying in the very conveniently located villa. The views from the house were all that was promised and more. We had all the essentials in the villa with comfortable places outdoor to read and lounge around. All in all I would say the villa was good value and I would recommend it for anyone wishing to stay in that part of Crete. village of Kefalas - car essential for exploring further afield. We had the most wonderful holiday in Crete, probably our best yet! The villa was ideal for our family of 5. It was set in very peaceful surroundings and in the lovely village of Kefalas where everyone was so welcoming. We ate at both restaurants frequently and enjoyed both. Maddies was very relaxed and we enjoyed the live Greek music at the restaurant above the Inka shop. The lady running the shop was lovely and so helpful too. The beds were comfortable and the kitchen well equipped. There was plenty of room around the pool for sun beds. The pool was such a welcome relief when we returned from days out and also to cool you down during the hot days. The air conditioning was great too. The views from the villa were just amazing. I would jump out of bed in the morning and just go and sit out there on my own and enjoy the scenery and peace and quiet. Just perfect. For us the villa was ideal, it was within driving distance to lots of fabulous places to visit, including beaches. Our favourite two being Kalives and Alymirda. We had great communication from the owner too. We will definitely be booking to stay here again and have recommended it to family & friends. We had to cancel our holiday in the villa due to personal circumstances. Pon Logan, the owner, was very cooperative in admin activities required to claim back our money from the insurance company. That was very much appreciated. It was a nice villa accommodation for a week stay. The village of Kefelas was very quiet only a shop, restaurant and bar but that is all we needed. It was very peaceful at the villa and pretty area. Sunbathing you can hear the birds and sheep bells next door was very relaxing and quiet. The views from the villa were lovely over the sea. My son who is only 1 found the unheated pool too cold at first but got used to it by the end! We had a lovely time in our own pool which we’ve never had before. It was the perfect size villa for a small family of 3. The only criticism I would say would be the villa needs a little updating with the single beds in the guest room not too comfortable to sleep on. Also, the sofas are basic and not so comfortable. We didn’t use the bbq but all the kitchen equipment for self catering was great. The balcony views were lovely. The only other criticism would be the villa needs a little care. Maybe we just have very high standards! I would give it a 3 star but the views and own pool make it better. The village is walkable when we found out how to get their on the meandering small streets! You can turn left at the top of the street and down the hill and around then turn right onto the main road which takes you by the restaurant. The food their is very good! The first night we arrived they had Greek musicians and we had such a lovely time. Maddies bar is fun too with big garden and playground next door. My son loved chasing the stray cats! Trips to Rethymno well worth it very pretty fortress and harbour is lovely with restaurants and shops! Also, we went to Almyrida and Georgiopolis beaches which were a bit busier towns. Vamos is a sleepy town nearby with more shops and tavernas. Vamos has the old village buildings there too. Crete is beautiful! This villa gives you what you need for a family stay! Driving from Kefalas, travelling west following the coast you will encounter a stunning, breathtaking down trail with amazing views all the way to Almirida, Plaka, then to Kalives. This will take 20 mins. You can reach Kalives in 10-15 mins driving through Vamos, passing Tsivaras. To the east you can find Georgiopoli beach tourist resort within 10mins drive. Car use is essential. Bike hire is available at Georgioupoli. Two main airports service area- Chania Airport 30-45 mins drive from villa. Heraklion airport 1½ - 2 hours drive from villa. Ports in Souda Bay 30 mins drive from villa. Kefalas is well situated to visit a great variety of villages of ancient history / archaeological or typical local life interest within a very short distance, 10-15 minutes drive away Gavalohori, Aptera, Kokkino Chorio, Plaka, Aspro, Kalami, Stylos, Vryses, Vamos etc. There is also Lake Kournas and the beach resorts of Kalives, Almirida and Georgioupoli. Kefalas has several tavernas and small supermarket shops. Neighbouring villages like selia, Xerosteni, ect also provide a range of tavernas. Litsarda offers an excellent taverna/pizza restaurant. Vamos is the largest town in the area. It has Banks and a 24hr Health Centre, bakary, butchers, grocery shops and many tavernas to eat and drink. Booking Notes: 1) To secure booking a down payment of 25% of total cost is required. Balance 75% payment is required to be paid 60 days before arrival to the Villa. 2) If you wish to pay on your arrival to the Villa then 50% of the total cost to be paid as soon as possible then the balance can be paid on your arrival by cash. However there will be a additional charge of €30 will apply if you are paying any cash at the villa. 3) You can make payments to UK bank account in Sterling or Crete bank account in Euros. And also you can choose to pay in to our Paypal account. 4) Any bank charges or Paypal charges are not included in the total price. 5) If you choose to pay in sterling currency, please contact the owner for England bank account details. 6) If you are paying in Sterling currency then the owner will inform you the currency exchange rate. 7) Any bookings 3 weeks or more will have discount. 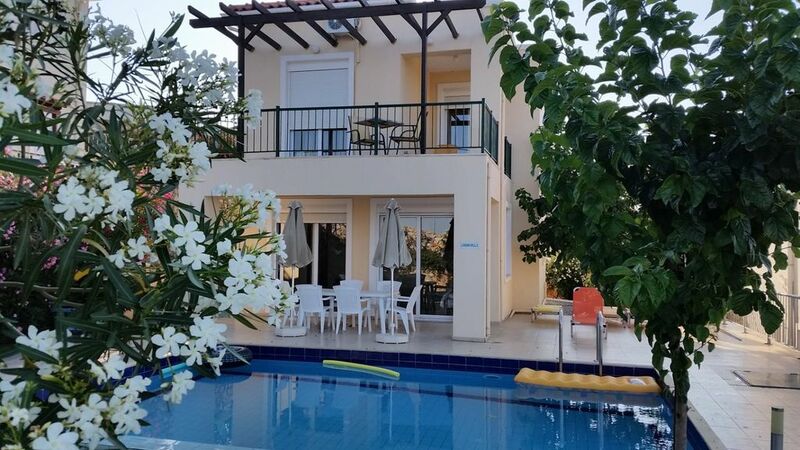 8) Unlimited down load Internet connection with a land line phone will be provided with your request and there will be a additional charge of €30.00 for 7 nights. Changeover Day: Changeover day is flexible. Transport: Transport can be provided from Chania Airport by our welcome team however it is depend on number of people in your group. If you require midweek cleaning additional charge will apply.